This is a basic tutorial for the Unity Interface / Desktop which comes with Ubuntu 13.04 – it should help get you up and running. Each new version of Unity (introduced in 11.04) improves on the functionality of the desktop. This tutorial reflects the way I understand and use the Unity interface. The menus displayed in the Panel are only for the active (topmost) application window. The menus are only displayed when you hover your mouse over the Panel, otherwise, the Panel is empty. If a window is maximized (full screen), the buttons (icons) for minimize, maximize, and close are hidden unless you hover your mouse over the panel. This might seem like a step backward. Why hide the menu bar? Why make the user have to move the mouse all the way to the panel to access it? While it gives a little extra window space to the application, it is also inefficient – and this was the problem with Unity in Ubuntu 11.04 and 11.10. Since Ubuntu 12.04, Unity has the HUD. The HUD makes mousing / navigating through menus obsolete (mostly). Despite being the most prominent feature of the Unity interface, it is the one I use the least. Application Launcher: clicking on an icon will launch the application associated with that icon. e.g. Clicking on the FireFox icon launches the FireFox browser. Visual indicator of running applications: any running application has its icon placed in the Launcher and an indicator showing its status. Two solid triangles: this is the active application (the one on top). Single solid triangle: the application is running, but does not have focus (is not on top). 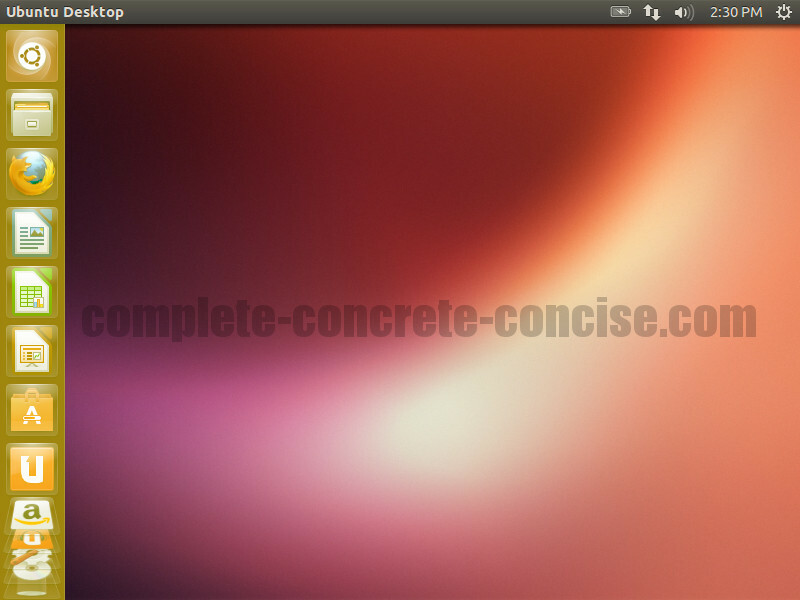 Single open triangle: the application is running in a different workspace (by default, Ubuntu 13.04 sets up only a single workspace. You can read how to enable workspaces here.). Application Switcher: you can switch to an application (bring it to the front) by clicking on its icon in the Launcher. Note: removing an application from the Launcher does not uninstall the application. The Launcher can become cluttered with applications (when you install an application using the Ubuntu Software Center, it is usually automatically placed in the Launcher). 1) Right-click on the application you want to remove from the launcher. This will display a popup menu. Sometimes, an application is not added to the Launcher, or you had previously removed it. 1) Start the application / program you want to add to the Launcher. 2) Find the application’s icon in the Launcher. 3) Right-click on the icon. This will display a popup menu. In general, only the most commonly used applications should be in the launcher. The Dash replaces searching through menu hierarchies for applications. Like anything new, it feels all wrong, but, I found it very easy to pick up and now prefer it over the traditional menu navigating paradigm. Instead or navigating a hierarchy of menus, Dash provides a query field in which you type the name of the application or document you want to open. Using the Dash interface is very much like searching with Google – as you type in what you are looking for, Dash displays possible results. I think the greatest strength of Dash is that you can navigate it completely via the keyboard, so you never alternate between typing and reaching for the mouse. The query field (outlined in green) is where the keyboard focus goes when you activate the Dash. Type the name of the application you want to run, or document you want to open. As you type, Dash will update the list of applications and documents. It has improved greatly since 11.04, if you type in game you will get Mahjong, AisleRiot Solitaire and Freecell Solitaire, and Sudoku. I suspect it may still miss certain applications because they are not listed in the “obvious” way. For example, previous versions of Unity would not display Sudoku if you typed in game – you needed to type in puzzle. If you type in games it will only display AisleRiot Solitaire, but none of the other games. A list of the most recently used applications (outlined in red) is displayed. If you type in the query field, the list of applications is modified to match your search. You can use your mouse to select an application, or you can use the arrow keys to navigate to the desired application (and then press Enter. I like using the arrow keys because my hands don’t have to leave the keyboard. A list of the most recent viewed documents (outlined in blue) is displayed. If you type in the query field, the list of documents is modified to match your search. You can use your mouse or the arrow keys to navigate and select the desired document. I like using the arrow keys because my hands don’t have to leave the keyboard. Relevant search results from Amazon (outlined in yellow) . As you type your query, it is sent to Amazon (anonymously via Ubuntu) and relevant results are displayed. Many people find this intrusive and disable this feature. Instructions to disable Amazon search results are here. I don’t have a problem with it, but wish it was more customizable. For instance, I don’t want Amazon search results in my main Dash panel. I don’t mind them if I am using the music lens or movie lens (explained in more detail below). Unfortunately, there is no way to selectively enable Amazon search results. Dash lens: this is the default lens – it searches everything you are possibly connected to which includes your computer as well as any cloud services you use. Applications lens: this focuses searches only within applications. 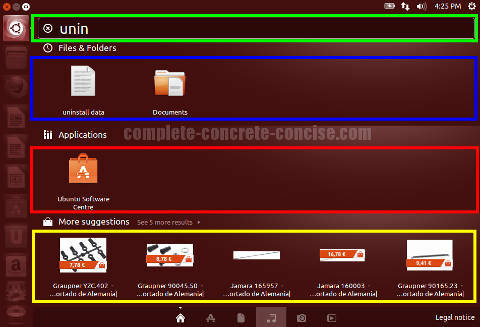 Folders and Documents lens: this focuses searches only on folders and documents. Music lens: focuses search on music. Photos Lens: focuses search on photos. Video lens: focuses search on videos. You can navigate to the lenses using either the mouse or keyboard. Typing Ctrl + Tab will navigate through the lenses. Note: the cheat sheet only appears if your screen resolution is 1024×768 or greater. The HUD was introduced in Ubuntu 12.04 and combined with Dash it provides a powerful way of interacting with your applications. Just as Dash replaces navigating a hierarchy of menus to find applications and documents, HUD replaces navigating a hierarchy of menus in an application. Instead or navigating a hierarchy of menus, HUD provides a query field in which you type the name of the action you want to perform with your applications. Normally, to do something in a program you either use a keyboard shortcut (like Ctrl+B to bold text in a word processor), or you use the mouse to select an option from a menu or toolbar. With HUD, you type in what you want to do. The HUD interface will then locate appropriate / matching menu entries and display them to you to select. Again, you can use the mouse to perform the selection or the arrow keys and the Enter key. I think the greatest strength of HUD is that you can navigate it completely via the keyboard, so you never alternate between typing and reaching for the mouse. Note: tapping the Alt keys means pressing it as though you intend to type it. It does not mean holding down the key. If you hold the Alt key down for about 2 seconds, the application menu bar will display in the Panel. As soon as yo let go of the Alt key, it will disappear – thus encouraging use of the keyboard to select a menu option (e.g. Alt + F to open the File menu). The query field (outlined in red) is where you type the operation you want to perform in the application, e.g. open, new, auto white balance, etc. This is where the focus goes when you activate the HUD. 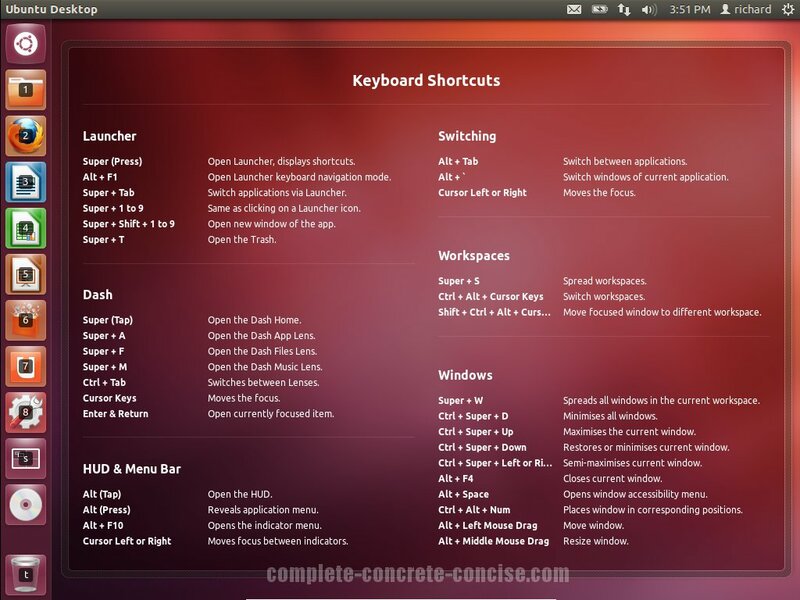 As you type, a list of possible commands will be displayed below it. You can navigate those commands using the mouse and clicking to select or the keyboard (arrow keys) and pressing Enter to select. By default, the top command is always selected and will be executed if you press Enter. A nice thing is that you do not have to type the whole command. Note: if a command is not available (for example, it is greyed out), then it will not appear in the list of commands. For example, if you have just opened GIMP without any image, it is not possible to perform image operations on it (like unsharp mask, or auto color enhance, etc). So if you type unsharp into the query field, you will not receive any options. I think it would be better if the HUD somehow indicated that the operation is unavailable rather than just not showing it at all. On the left, the icon (outlined in green) shows which application the command is for. The HUD may display commands for other programs (not just the active one). This can be confusing if you are not paying attention. Below the query field is a list of matching commands (outlined in blue. Note: HUD may not work with all applications – it depends on how the menus in an application were coded. Prior to Ubuntu 13.04, LibreOffice was an application that did not work with the HUD (there was a patch available to make it work, though). 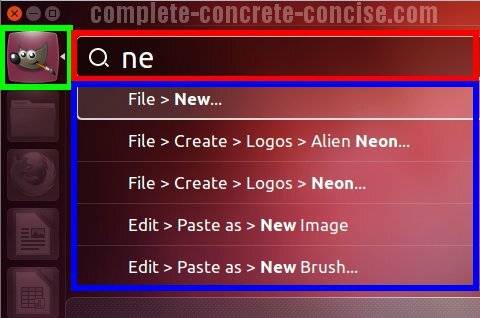 Unity is a new way of interacting with the computer: instead of navigating a hierarchy of menus, you type what you want to do. As an old timer (my first interactions with a computer were via a teletype), I never really liked the mouse / GUI way of doing things because it required me to take one hand off the keyboard. As a consequence, I have always configured shortcut keys to perform common tasks. With Unity, I am able to keep my hands on the keyboard and easily perform the tasks I need. 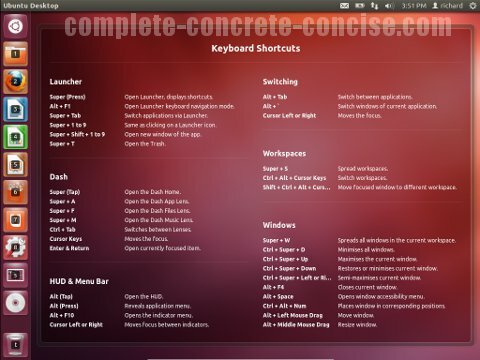 I still program my shortcut keys, but I know longer have to navigate through menus to find some lesser used operation. Play with it. I think you will find it easy to learn. I have found it easier to adapt to than the Ribbon interface Microsoft introduced a few years ago. I find the Dash and HUD work well when I am very familiar with the programs / applications I am working with and I know the command set. I find the HUD awkward to work with when I am not familiar with an application. For example, perhaps I install Blender to try out some 3D graphics development. Not being familiar with Blender, it is very awkward to try typing commands into the HUD in the hope of finding the right one. This is definitely a case where being able to browse through a bunch of menus can be helpful. Of course, I can always type help and hope a help file comes up. It is with new or unfamiliar applications that I miss the menu bar at the top, but even if a menu bar was visible, there have been times when I could not find what I wanted and had to google to discover how it was named or where it was located.